$99 gets you the HTC ThunderBolt, but only if you live in Michigan? 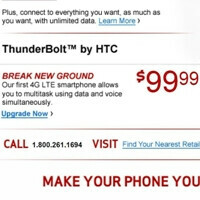 The HTC ThunderBolt is the first 4G LTE smartphone to be released by Verizon Wireless, so it carries a premium price of $249.99 (with 2-year contact). 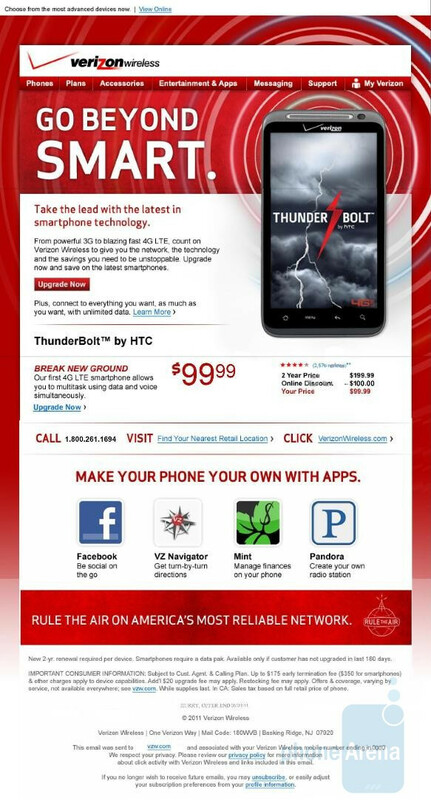 But we've heard that some Verizon customers who live in the state of Michigan have recieved a promotional email from the carrier saying that they can purchase the HTC ThunderBolt for the low price of $99.99. So what's the catch? The fine print points out that you have to renew your 2 year contract and you have to be at least 180 days since your last upgrade. Not too bad, as that is taking $150 off the regular 2-year price. Now it would be nice if Verizon would offer this deal to all their customers. What do you think? $199.99 isn't even the normal Verizon Wireless 2-year price in most places. A zip code for Michigan is... 48930 if anyone actually thinks this is true i would advise you to go to VZW.com and type in that zip code as your own and see what the pricing is for the Thunderbolt. weird its 249.99 For one time, do some research before you post something like this, my five year old newphew would have though of that. This doesn't seem too unrealistic. Going to the website and entering a zip code won't pull up an offer like this. Verizon sends direct communications to customers via email/flyer even text targeted at a specific customer base or region from time to time.